A naturalistic play space, designed by LUC and Erect Architecture, is a new highlight as the North Park re-opens. The Tumbling Bay play space, one of the new interventions in the north of Queen Elizabeth Olympic Park, opens at the end of this month. 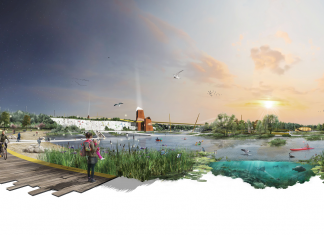 Designed by LUC and Erect Architecture, the space will form the social core of the northern part of the park, aimed at both the immediate visiting communities and at new residents and workers coming to the area. The naturalistic play space, based on ecological concepts of succession and life cycles, is set in the riverine landscape, with the Timber Lodge café and community hub as its focus. Children of all ages and abilities will experience a wide range of environments and play that will tell stories of the life-cycles of individual plants. In the pioneer hazel woodland copses they will be able to explore willow seed pod dens, hunt for bugs and get their hands dirty. The copses lead to climax pine forest where Erect’s bespoke nest-like climbing structures invite high physical activity and offer expansive views of the wider park for those brave enough to accept the challenge. 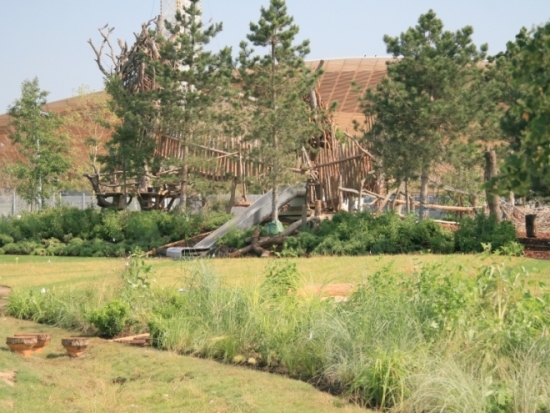 The sand and water play area was inspired by the history of the River Lea and its industrial past. It allows children to become water engineers – encouraging them to work in groups and pump sufficient water to dam and divert water through the natural rock pools, rivulets and industrial channels, creating a series of splash pools and sand traps along the way. The fluid landform and swathes of draped planting ensure that the topography blends seamlessly into the wider parkland. Permeable boundaries on three sides will encourage children to continue to play beyond the designated play space. Queen Elizabeth Olympic Park will open in phases as the construction works complete. Parts of the north of the park – including the new Timber Lodge cafe, Tumbling Bay playground and the Copper Box – open to the public at the end of July. It will be free to visit the parklands, cafe and playground.